We’re thrilled to see Exton Park Brut Reserve NV included in Lettie Teague’s line up of what to drink more of in 2019. As Lettie says, it’s new, truly special, a lush fruity aperitif, and a great conversation piece! Available from select retailers in New York and New Jersey, with options for out of state shipping. Exton Park Rose NV makes number 2 on Decanter’s list of sparkling wines for the festive season. ‘Vibrant and clean with good tension and well-defined flavors. Long and vinous on the finish, showing rich fruit and floral complexity’ Yes please! We are thrilled to see two of our wines winning Gold Medals in recent international wine competitions. Exton Park Rose NV was awarded Gold at the 2018 Decanter World Wine Awards, and Hoffmann & Rathbone Blanc de Blancs 2011 won "Gold", "Best in Show (by country for England)" and "Best Wine of the Year (by package)" at the London Wine Competition. Congratulations to them both! Now you have a new way to show your love of British bubbles. 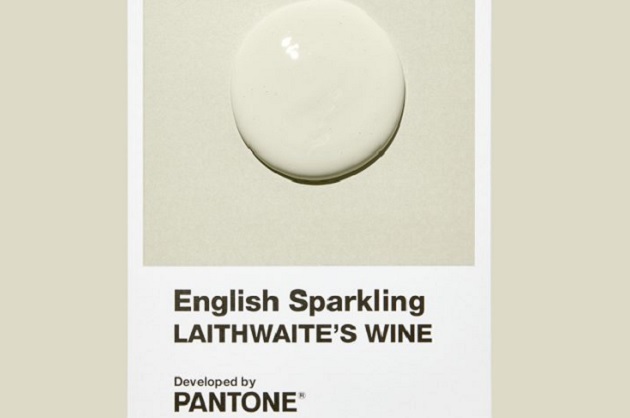 ‘English Sparkling’ was officially announced as a new color by the influential Pantone Color Institute, which standardizes color reproduction for paper, fabric and digital creations. The creamy, white-gold hue developed by Pantone was inspired by Laithwaite’s Wine in the U.K. and joins Burgundy, Merlot, Zinfandel and others in the palette. Now you can have your paint and drink it too! In its December issue, Wine Enthusiast tasted over 30 wines from 12 different producers in England. We're pleased to see the high ratings for both Exton Park and Hoffmann & Rathbone. We are delighted to expand our portfolio with the addition of Hoffmann & Rathbone as our second English producer. Hoffmann & Rathbone is a boutique winery handcrafting premium sparkling wines from the best selected Sussex grown grapes. All of their wines spend at least three years maturing in bottle on lees, and nothing is released until the fine flavors and delicate layers are ready. Three beautiful sparkling wines and 1 still dry white wine will be available in January. Fall Harvest in Full Swing! Loading pinot. The conveyor is new this year. Last year it was all loaded by hand! Enjoying a new disgorgement of the rosé wine. England in a bottle - with the hand of our French winemaker Corinne! I was fortunate enough to spend a day at Exton Park last week and see the harvest in full swing. I even loaded a few crates into the press! Volumes are down this year due to the spring frosts, which also led to an unusual picking pattern, needing multiple passes through the vineyard. The quality of the fruit that is there though is very good. I was again impressed at how focused Corinne and Fred are on making wines that reflect their unique terroir, with minimal intervention and manipulation. While there, we loaded Pinot Noir to the press that was picked that morning. The pressing is very gentle, taking 2-3 hours for several tons of fruit, and the juice is kept away from oxygen to retain the freshness of the fruit. Now Available in NYC Stores! We're excited to bring Exton Park's delicious sparkling wines directly to you through our retail partners. Check out the Find Us section for the latest updates on locations and availability as we continue to add more speciality and fine wine retailers. While bubbly is good any week out of the year, it's especially nice during this annual event in June that promotes awareness for English wine producers. We also raise a toast to Exton Park for winning several awards during English Wine Week 2017, including a Silver Decanter Magazine World Wine Award for the NV Brut Reserve. 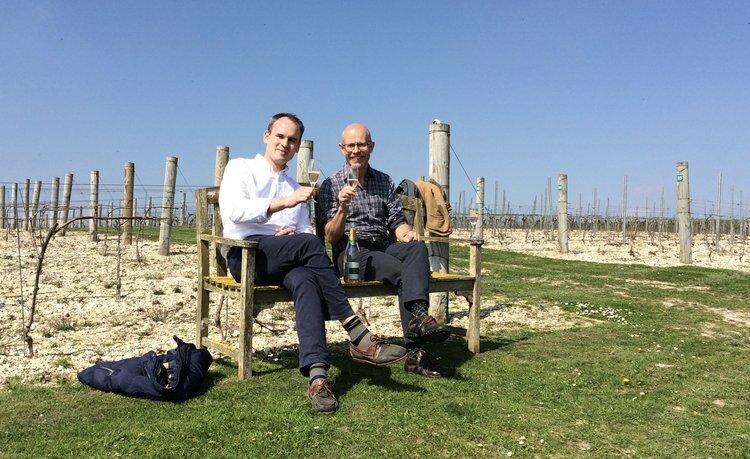 Tasting the Rosé NV in the vineyard with Exton Park's sales and marketing manager Kit Ellen on a glorious April morning. We are thrilled to bring Exton Park's award-winning sparkling wines to New York! It's been less than a year since the idea first bubbled up, and we couldn't have found a better partner to start this journey. Exton's wines are elegant, refreshing and an excellent reflection of the unique chalky terroir of the South Downs. Contact us to learn more about stocking the Brut Reserve NV, Rosé NV, , Blanc de Noirs NV, and Blanc de Blancs 2011. The pallet with 612 bottles bound for New York. Happy to be mentioned as a pioneering British importer in Elin McCoy's article in April's Decanter! 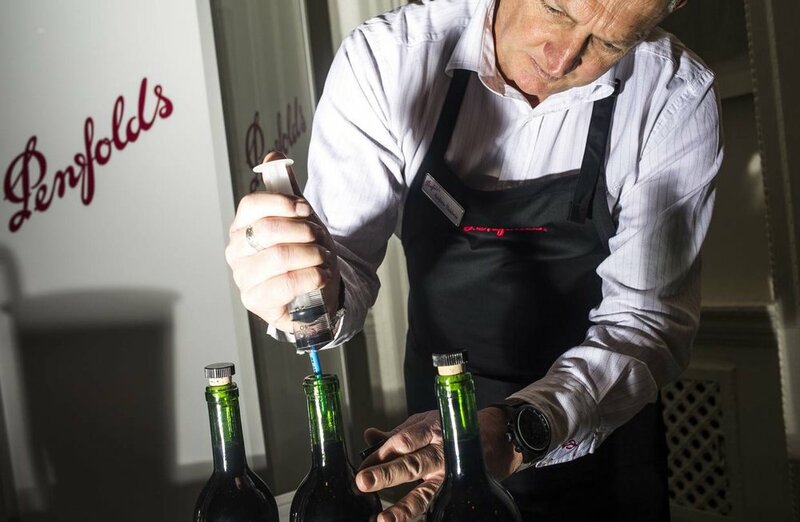 The Wine and Spirits Trade Association (WSTA) held a masterclass tasting with Ministers of Parliament (MPs) on February 6th to showcase the south of England’s finest blends. Wines included Bolney Wine Estate, Gusbourne, Exton Park, Chapel Down, Furleigh Estate, Hambledon, Hattingley Valley, Nyetimber, Ridgeview, Hush Heath, Plumpton Estate and Rathfinny. WTSA educated politicians on the successes of English wine and also shared the importance of the wider UK wine industry to Britain’s economy and jobs. The last decade has seen explosive growth, with 133 wineries and 180 vineyards open to the public and 502 vineyards overall. By 2020 the trade industry expects 50% further growth. British winemakers have struggled for half a century to find an iconic name for their wines. 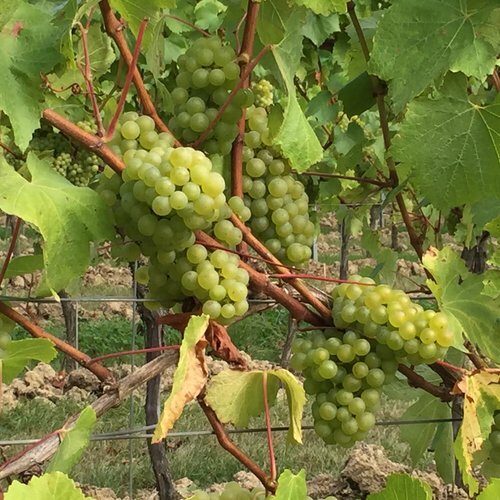 Now there's a new term that's been floated around for the elusive bubbly, 'British Fizz', and the UK Vineyard Association (UKVA) has applied to protect it so that only grapes grown in England, Wales, or Scotland will be able to use it. Bob Lindo, author of the protected geographical indication (PGI) application, says the name isn't intended to replace English sparkling wine, as it is currently known: "This is a way for us to reclaim the 'British' category for people producing wines with English grown grapes. It isn't meant to be a catch-all name. Will it catch on or confuse people? Only time will tell, but 'English Sparkling Wine' still conveys an elegance that represents the product quite well. 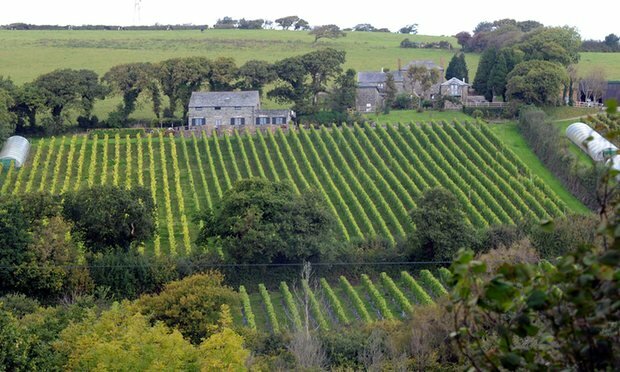 English vineyards are specialising increasingly in sparkling wines. They have attracted considerable attention, winning gold medals against reputable French competition over the past decade or so, with many bottles going for prices on a par with the top French champagnes. Agricultural land values — at £10,000-£20,000 per hectare, are about 1 per cent or less than those in France — have sprouted upwards as a result. French champagne house Taittinger has taken note and bought land in southern England to produce its own version of the local fizz, with plans to sell its wine in the UK. 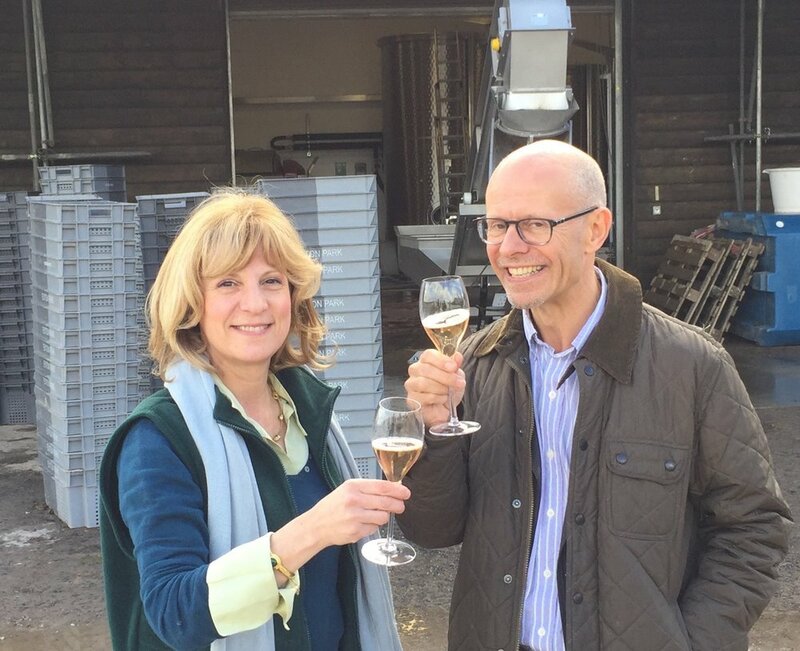 French expertise also guides the progress at Hampshire-based sparkling wine makers Hambledon and Exton Park. Despite the arrival of such a leading producer, the English sparkling wine industry still largely comprises family businesses. Some of the newest ones are supported by one or two wealthy investors, drawn by the potential for English sparkling wines. 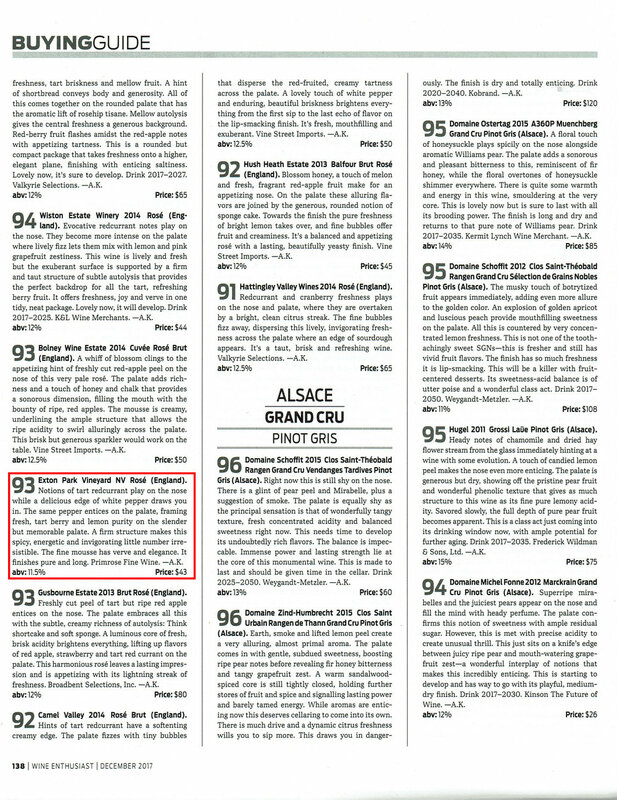 The wine experience can take you to many places, and last month it stopped in Australia (via Manhattan). I was honored to meet and talk with Peter Gago, Penfold's chief winemaker, at a re-corking and tasting event. The passion that he and his team put in is apparent in every bottle that they produce. Great write up about the event by Lettie Teague in The Wall Street Journal, and nice we were able to get a mention about English sparkling and Primrose Fine Wine. 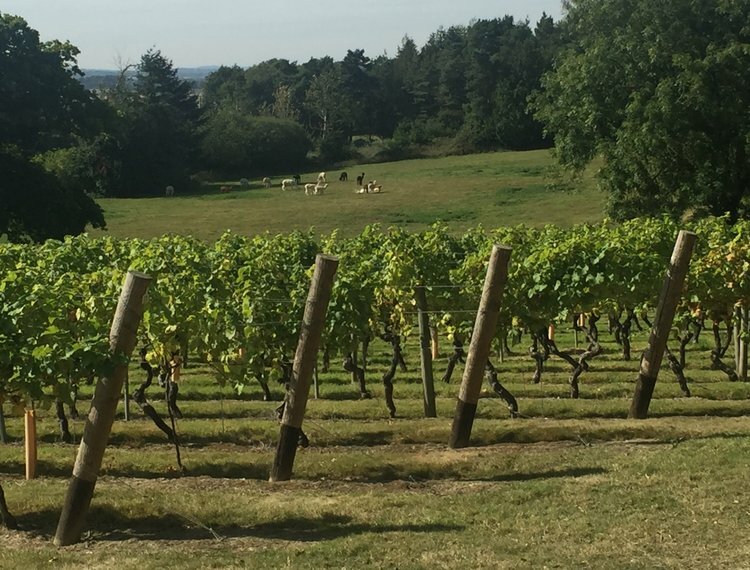 I had the chance to visit many vineyards in Kent, Sussex and Hampshire during a whirlwind trip to the UK in September. 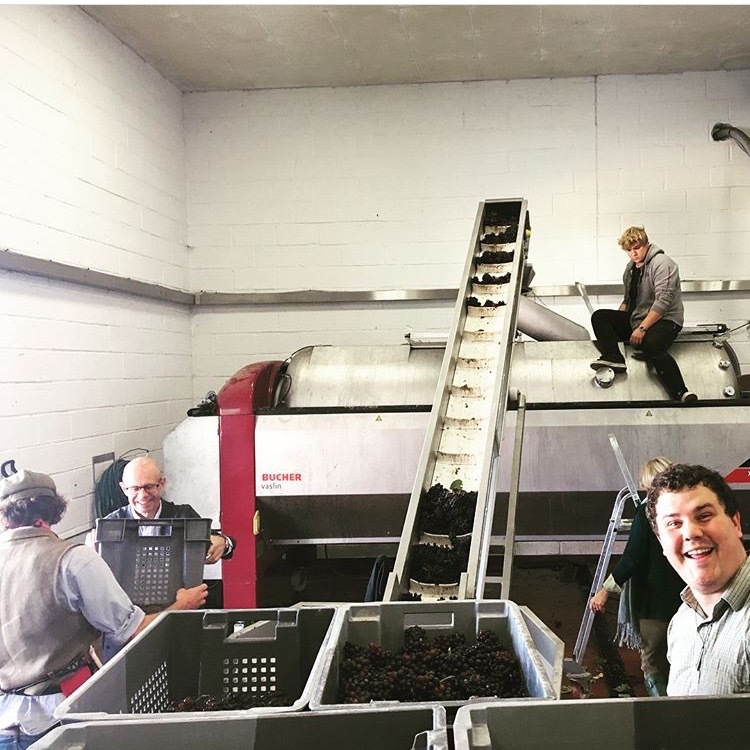 There's a real excitement about this year's harvest - with many winemakers talking about making vintages - and the prospects for English sparkling wine overall. After tasting several bottles you can see why English sparkling has racked up so many awards recently and generated international interest. The wine has its own personality, which Hugh Johnson has called "orchard freshness". It's true to the terroir while maintaining the qualities that you would expect from any great Champagne. There's still room for growth and refinement but English sparkling is definitely on an upward trajectory. A shipment of 5,000 bottles from four different producers is heading to the U.S, and that's just the beginning of an upward trend in exports. The first full container of English wine - 5,000 bottles from Digby Fine English, Hush Heath Estate, Bolney Wine Estate and Camel Valley - were shipped to the U.S this week by The British Bottle Company. All are award-winning sparkling wines made in the traditional method, with 90% utilising chardonnay, pinot noir and pinot meunier, the three grapes used to make champagne. Investment in equipment and expertise, together with a gradual increase in global temperatures, means Britain's sparkling wines rival the world's best fizz. “It’s no longer a novelty. It’s now known there are great sparkling wines coming out of England,” said Liz Willette of New York importer Grand Cru Selections. Sommeliers and consumers are now catching on, and in March the UK government announced its pledge to achieve a tenfold increase in English wine exports by 2020. We look forward to bringing even more quality selections to the New York area in 2017! Let the competition begin! English sparkling wines are finally making headlines around the world with victories in prestigious competitions. In the first tasting of its kind in Paris, those taking part said the English sparkling wine was better in two out of three categories, and it drew with the champagne in the other.